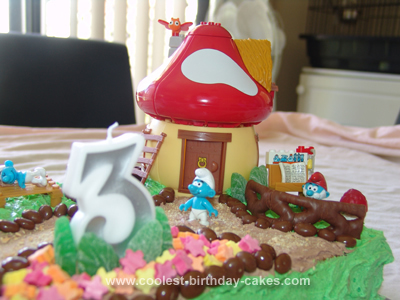 My 3 year old son is just in love with the Little Blue People the Smurfs, so it just had to be that for his birthday cake this year. I decided on making a Smurf Village for him. 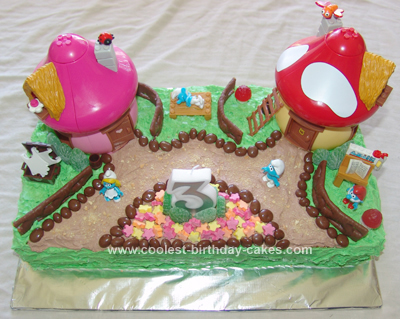 The base was just two square cakes put together to make a slab. A 3 mix of butter cream icing. Cocoa added to make the under path color. Chocolate sultana’s for the path borders, Spearmint leaves for the bushes around houses and garden, flowers are sliced different colored musk sticks, crumbed milk arrowroot biscuits to make the path a bit more rough and gritty looking. Mushrooms made out of small marshmallows and raspberry lolly on top. Fences are curly wurly chocolates. 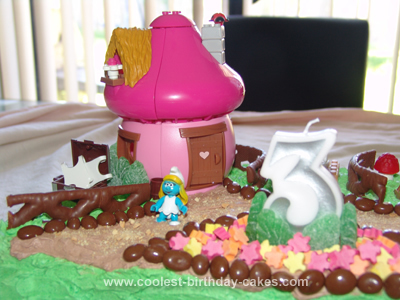 Smurf sets are Megablok sets purchased from Big W.
Birthday cake idea posted by Karen G.